Welcome to our range. We have several categories, simply click on the one that interest you and see where it takes you. There is so much to be found that is out of the ordinary and unusual from Wedding Truffle Towers to Chocolate Footballs and much in-between. 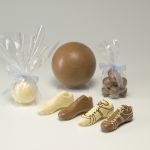 This is a chocolate adventure and it is all created in a small factory in Kent by Peter and Philip Stas and their small team of dedicated expert chocolatiers.